Space missions are not like date night. My wife and I often get to town before knowing what restaurant we’ll choose. It’s no big deal — we know we’ll find a table somewhere.. But space missions are planned around knowing where they are going. If a space agency like NASA or ESA (or JAXA or CNSA) is going to spend millions or even billions of dollars or euros (or yen or yuan) to build a spacecraft, it should have a destination right from the start, shouldn’t it? In the past few years there have been missions to the Moon, to other planets, asteroids, the outer Solar System, and comets. All these missions had destinations in advance. But what happens when a once-in-a-lifetime target zooms by and there is almost no time to prepare? ‘Oumuamua’s trajectory through the inner Solar System. Credit: Tom Ruen via Wikimedia Commons. We would have loved to take a closer look at ‘Oumuamua. But we couldn’t. There was nowhere near enough time to propose a space mission, get it approved and funded, then build and launch the space craft. Bummer. Enter a new concept: the intercept. Imagine that ‘Oumuamua was discovered a bit earlier than it actually was, a few months before its closest pass to Earth. And let’s also assume that a spacecraft was ready and waiting in orbit near Earth (likely in Earth’s L1 or L2 Lagrange point). Intercepting an interstellar object. The red curve shows the orbit of ‘Oumuamua, purple the orbit of Earth, and grey the path of the spacecraft. It is assumed that ‘Oumuamua was discovered in July 2017 (three months earlier than its actual discovery). If a spacecraft was launched from near Earth, it could have intercepted ‘Oumuamua on October 26th. Credit: Darryl Seligman (from this paper). It takes years to conceive and build a spacecraft. The Cassini mission to Saturn took 16 years from conception to launch! NASA’s New Horizons mission took five. NASA’s Lucy and Psyche missions — selected in 2017 — are both scheduled to take 4-5 years to launch. An object like ‘Oumuamua would be long gone if we had to wait 4-5 weeks from discovery to launch, let alone 4-5 years. The only way to reach it is to be ready and waiting when the object is discovered. This concept is the foundation of the Comet Interceptor mission proposed to ESA‘s call for F-class missions. The plan is to have a spacecraft ready when the next exciting object zooms past. But what type of object might that be? An interstellar object like ‘Oumuamua would be spectacular. But there are two issues. First, we don’t know how many are out there. It might be a month before the next one is found, or 10 years. Second, they move really fast. Because of fuel constraints only a fraction of ‘Oumuamua-like orbits are interceptable. The most likely target for Comet Interceptor is an Oort cloud comet. Specifically, a dynamically new comet. Cartoon view of the Oort cloud, which contains billions of comets thousands to hundreds of thousands of Astronomical Units from the Sun. From Space Facts. 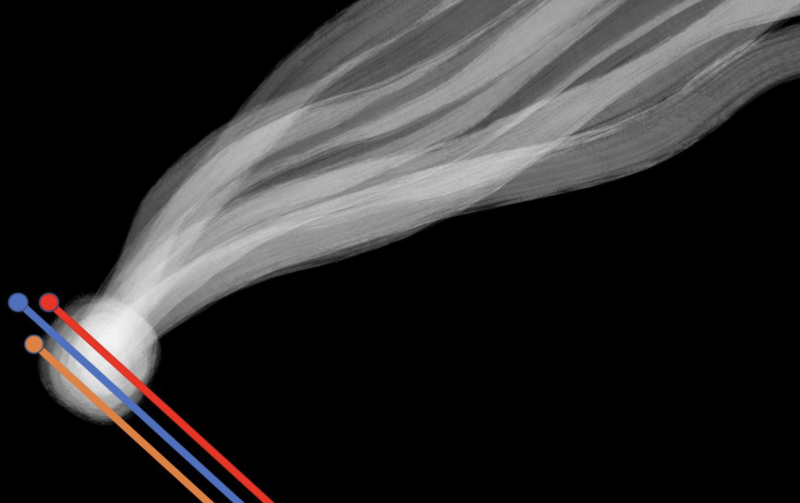 Dynamically new comets make great targets. They are making their first pass close to the Sun in billions of years. And, unlike interstellar objects, we know how many dynamically new comets are out there. Several new ones are found every year. ESA’s Rosetta mission encountered a Jupiter-family comet with a not-so-catchy name: 67P/Churyumov-Gerasimenko. Comet 67P as seen by Rosetta. Credit: ESA. Comet 67P came from the Kuiper belt. It had spent thousands of years inside Jupiter’s orbit, but only a couple centuries close enough to the Sun to vaporize water. Part of the reason it was chosen as a target was because its surface was relatively “fresh” and had not been cooked by the Sun for too long. A dynamically new comet from the Oort cloud — on its first pass close to the sun in billions of years — would be super-fresh! It is a window into the early Solar System. From Astronomy Picture of the Day. Image credit: Jerry Lodriguss (Catching the Light). The intense activity of Oort cloud comets comes from ices on their surfaces that are heated up and vaporized. This stuff has been in deep freeze since shortly after the Solar System formed. What would an intercept of an Oort cloud comet look like? Comet Interceptor is a fly-by mission. The plan is to cross the comet’s path and gather as much information as possible in a short window of time. Unlike Rosetta, the spacecraft cannot match speeds with the comet and spend months in orbit. (The fuel requirements would require a larger spacecraft, which would make it a billion-dollar-scale mission). NASA’s New Horizons mission showed that a fly-by can generate a ton of new science. New Horizons zoomed by Pluto and gathered almost all its data in a single day! Then it did the same again when it flew by Ultima Thule. It was spectacular. To get the most out of its fly-by, Comet Interceptor plans to deploy two (or more) extra mini-spacecraft. That way it can have multiple instruments taking measurements of the comet (or interstellar object if we’re lucky) at the same time! Cartoon of the Comet Interceptor concept. The main (orange) spacecraft will deploy two companions (blue and red). They will all fly through the comet’s come, taking different measurements at the same time. The main goal of the mission is simply to determine what the object looks like. A lot of the mystery surrounding ‘Oumuamua’s origins would be easily resolved if we just had a photo from up close. What is this object’s isotopic “fingerprint” (in particular with regards to water and Nitrogen), and how does it compare with Earth’s? What is the 3-dimensional structure of a cometary activity in terms of gas, dust, and plasma? What do the object’s constituent particles (dust, pebbles, boulders) look like? These should be the same types of particles that built the planets. Addressing any of these questions would be a big (scientific) step forward. Schematic of the layout of the proposed Comet Interceptor mission, including the mother spacecraft (an ESPA ring; spacecraft A) and the two small companion spacecraft (B1 and B2). Plus, the Comet Interceptor science team includes experts from across the globe (including me!). When do we find out if Comet Interceptor is a go? There are six competing F-class proposals. ESA should announce their decision by summer 2019. Fingers crossed! When and how will Comet Interceptor launch? How Comet Interceptor may launch, by squeezing into the extra space on Ariel’s launch vehicle. Credit: Zach Dickeson (twitter, website). If the Comet Interceptor mission is selected then it would launch at the same time as Ariel, in 2028 or so. By then we will have had a decade more observations to get a better idea of possible targets. New telescopes like LSST will give us a better idea of how many interstellar objects are out there and whether there is a realistic chance to intercept one. It will also tell us more about what to expect from Oort cloud comets. Now it’s up to ESA to decide: are you ready to intercept a comet? ← How planets die: pulverized in a deluge of asteroids and comets! That’s a really great idea. It makes a lot of sense to start planning now for whatever the next unknown and unexpected opportunity might arise. Interesting uncommon design of Spacecraft A! Is there any description of the rationale behind it? By the way, according to openness and outreach the Comet Interceptor should get its ticket to space. Because, besides Debye absolutely nothing is known so far about the other four phase-2 candidate missions.